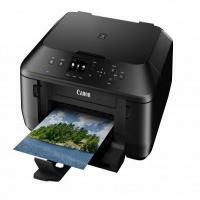 Canon Pixma MG5550 is an all-in-one inkjet printer for small office/home office (SOHO) users. The device offers all the basic functionality of an all-in-printer including printing, copying, and scanning. It offers all the advanced features that an average home office might require like, Wi-Fi connectivity, automatic duplexer, cloud and mobile device printing, and 5 ink cartridge system. This smart looking printer has one long output tray and one input tray at the front, that can hold up to 100 sheets at a time. Pixma MG5550 has a large 2.5in display with touch screen control panel. The printer produces high quality prints with maximum native print resolution of 4,800 X 1,200dpi and maximum optical resolution of 1,200 X 2,400dpi. The Canon Pixma MG5550 ink replacement cartridges are a great choice for SOHO users and photographers. The printer offers flexible media handling and is ideal for printing iron-on transfers, labels, and glossy / matte finish images. However, this good looking printer is limited to A4 printing and might not attract office users. On the other hand, the five ink cartridge system is an advantage and reduces the running cost of the printer. How to fix a Canon Pixma printer when it stops printing? Check the model number very carefully and make sure you have right Canon Pixma MG5550 Ink Cartridges installed in the printer. The machine will not print properly if the wrong cartridges are used. Also, make sure these cartridges are installed in the right colour slots. 1. Ensure that the machine is turned ON, and then open the Scanning Unit. The ink cartridge holder moves to the left. 3. Hold the cartridges carefully to avoid staining your clothes or the surrounding work area. Keep the empty cartridges aside safely, for recycling purposes. Black ink cartridge should be installed into the left holder and Color cartridge should go into the right holder. Lift the Scanning Unit slightly and put the Scanning Unit Support back to its original position. Then close the Scanning Unit. The cartridge holder would automatically move to the right. Q. Will my compatible Canon Pixma MG5550 ink cartridges get exhausted faster if I run the process of head cleaning for my printer? A. Yes, the process of cleaning heads consumes ink, so your ink cartridges will get exhausted sooner if you do it more often. Q. Are Canon Pixma MG5550 ink cartridges suitable for home use? I want good ink cartridges that carry out simple printing jobs (which is in bulk sometimes) without being expensive. A. Yes, these ink cartridges are ideal for home use as they will help you print at any level you want. You can print documents or images in large numbers whenever you want with these ink cartridges and be sure of good output and cost-effectiveness. Q. If I need replacement of ink cartridges purchased from you within two days, can you facilitate it? A. If the cartridges are faulty and are able to understand the situation fully up to our level, we can initiate the process of replacement right away. You just need to let us know the problem as early as possible through a phone call so we can assess the situation immediately and start with the replacement process to get it done within two days. Q. I bought a couple of huge multipacks of Canon Pixma MG5550 ink cartridges for all the printers in my department at work. A few are remaining, which I need to store properly. Could you please tell me the right way to store them? A. Please make sure that you store the cartridges that you’ll be using later remain unopened in their packaging and keep them in a sealed bag. Place them in a cooler temperature where there’s no dust and no sunlight. Also, keep the cartridges standing in the upright position all the time as it prevents mixing of ink of all the cartridges. Please try to use them within a year from the date of manufacture. Q. Can I trust your compatible Canon Pixma MG5550 ink cartridges to work without causing any problem to my printer? A. Yes, absolutely. All our compatible ink cartridges are FSC tested and certified. They are manufactured to work well with your printer without causing any hassle. You can use our compatible ink cartridges without worrying about any damage caused to your printer. Q. How much space does the Canon Pixma MG5550 take up? A. Canon Pixma MG5550 printers measure 455 mm in width, 369 mm in depth, 148 mm in height and weight about 6.3 kg making them lightweight and easy to move around. Q. Where can Canon Pixma MG5550 printers ideally be used? A. Canon Pixma MG5550 printers come with a 5 ink cartridge system and also have scanning and copying features, making them useful for small offices. However, the printer can produce high quality output and Wi-Fi connectivity which makes it suitable for photographers and home users. Q. I have run out of magenta ink for my Canon Pixma MG5550. Do you provide magenta Canon Pixma MG5550 ink cartridges individually or will I have to buy all the colours together? A. Yes, we provide individual Canon Pixma MG5550 ink cartridges of all colours. Our customers are given a choice whether to buy the ink cartridges individually, so that they can replace only the colour that has run out, or to buy them in multipacks which contain all the colours. Q. How many pages can Canon Pixma MG5550 printers print in a minute? A. Canon Pixma MG5550 printers can print black and white printouts up to a speed of 12.2 pages per minute and colour printouts up to 8.7 pages per minute. Q. How long would it take for Canon Pixma MG5550 ink cartridges to be delivered to me in Limerick? A. Usually, if you place an order before 12 noon, you can expect the product to be delivered within 1 - 2 days. Incase your product is urgent, you can contact us on 048 308332211 and we will try to deliver the product to you as fast as possible. Q. Does the Canon MG5550 printer allow us to enlarge or reduce the size of the original document? A. Yes, this canon printer allows you to adjust the size of the original document. The size can vary between 25% to 400%. You can change this in the settings of your printer. For further assistance on this, you can refer to your printer manual. Q. Do you stock compatible Canon Pixma MG5550 ink cartridges for Canon MG5550 printer? A. Yes, of course, we stock the compatible ink cartridges for Canon MG5550 printer. You can buy individual as well as the multipack of the PGI-550 black cartridge and a CLI-551 ink cartridges depending upon your printing needs. Q. The Canon MG5550 printer has both PGI-550 black cartridge and CLI-551 black cartridge but at the time of printing it does not use the 551 cartridge which resulted in a lot of leftover ink in the cartridge. Can there be changes made in the settings of the printer so that it uses more of 551 ink instead of 550 ink? A. The type of Canon Pixma MG5550 ink cartridges that the printer uses cannot be changed through the settings of the printer. All this depends upon the type of printing carried out by the printer. If your printout is purely text based, then your printer consumes PGI-550 black cartridges but in case of photo printing and graphics, your printer uses both the ink cartridges. You may purchase PGI-550 black cartridges separately so that your Canon Pixma MG5550 ink cartridges do not go waste. Q. I have bought a new Canon MG5550 printer. But unfortunately I threw the box away. Where can I see the serial number of the printer? A. For the serial number of the printer, turn the printer upside down. There is a rectangular area from where you can access the workings of the printer, in case you need to clear the paper jam. Just on the left side of this, a sticker displaying a barcode and a serial number. Q. Is the ink volume the same in the compatible PG-540XL and CL541XL as it is in the original Canon inks? A. The ink volumes of the remanufactured will equal or exceed the ink of the original brand cartridge. Q. Can I replace the black only P540 in my Canon Pixma MG5550 even if it has a CL-541XL colour cartridge already in it? A. Canon Pixma MG5550 ink cartridges are available in both the standard capacity and high capacity volumes, you can mix and match if you wish but in our opinion the high capacity PG-540XL will be much better value for you. Q. My print quality is not very good, how do I know if my Canon Pixma MG5550 ink cartridges need replacing? A. Your printer will give you an instruction when it is time to replace your ink cartridge. It may be that your print head is blocked. This can happen if the printer has been sitting idle for some time (several weeks or months). The first step to checking if this is the case is to go to the printer maintenance and print a test sheet. If the test sheet shows inconsistencies in the print quality then you will need to carry out a head cleaning procedure, this is accessible fin the maintenance setting in your printer. Q. Are there any larger multipacks of the black and colour ink cartridges for my printer? A. We currently have a single 2 pack of the PG-540XL and CL-541XL available to buy, if you required a large quantity of these inks then please contact our customer service department who can advise you of any discounts that may be available for bulk buying. Q. How to distinguish between the ink colours just by looking at the cartridge? Q. Are Compatible Canon Pixma MG5550 ink cartridges (CLI551MXL Magenta/Cyan High Capacity) good option for printing invitation cards? A. Yes indeed. These cartridges are good at producing rich colours and crispy text texture that is must in invitation cards. Hence, this is great product for you. Q. How many cartridges are required in Canon Pixma MG5550 printer? A. The Canon Pixma MG5550 have 5 individual ink tanks for Pigmented Black, Black, Cyan, Magenta and Yellow respectively. Q. What is the expected cost of printing a single page? Also, if you calculate the expected cost of cartridges altogether, it is 0.86p per page. Note: The above mentioned price is based on 5% coverage printed onto plain A4 size paper. Q. What is the expected yield of Canon Pixma MG5550 compatible ink cartridges? A. The yield also differs according to the cartridges. High capacity Black cartridge gives a yield of 1130 and 620 pages respectively. Whereas, the Cyan coloured ink gives an expected yield of 700 pages, magenta ink gives print yield of 660 pages and yellow coloured ink gives an expected yield of 685 pages. Q. What is the shelf life of these Canon Pixma MG5550 ink cartridges? A. The on paper shelf life of these cartridges is 3 years. Hence, you need not to worry regarding inks getting dried. Q. Can I buy all colours of Canon Pixma MG5550 ink cartridges altogether under any offer? A. Yes, if you want all colours of Canon Pixma MG5550 ink cartridges, you can buy either Compatible Canon PGI550XLBK/CLI551XL B/C/M/Y 5 Cartridge Multipack or Compatible Canon PGI550XLBK/CLI551XL B/C/M/Y 10 Cartridge Multipack which not only gives you quality product at discounted cost but also offers value for money. Q. What is the maximum document size that Canon Pixma MG5550 printer can scan? A. The MG5550 printer can scan maximum document size of 216*297 mm. Q. What is the amount of ink that one receives in these Canon Pixma MG5550 ink cartridges? Q. Does Canon’s Pixma MG5550 printer supports Japanese? A. Yes, the printer supports 30 languages which are as follows · English, German, French, Italian, Japanese, Dutch, Spanish, Portuguese, Norwegian, Swedish, Danish, Finnish, Russian, Czech, Hungarian, Polish, Slovene, Turkish, Greek, Slovakian, Estonian, Latvian, Lithuanian, Ukrainian, Romanian, Bulgarian, Japanese, Simplified Chinese, Traditional Chinese, Korean, Indonesian. Q. What are the Operating Systems that Canon’s Pixma MG5550 printer supports? Q. Does Canon’s Pixma MG5550 supports android platform? A. Yes, the printer supports android platform. You can connect the printer to your phone and can print the documents saved in memory or from the internet.